What Personalization Do You Want? Do You Want Block Or Script Writing? 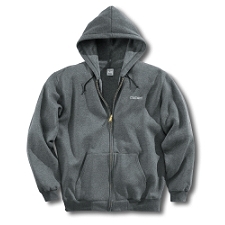 Select ... 1/4" 5/16" 3/8" 7/16" 1/2" 3/4" 1"
Our midweight hooded zip-front sweatshirt brings considerable comfort to cool-weather worksites. Its 50% cotton 50% polyester fleece blend provides plenty of warmth and a full-length brass front zipper let you regulate the temperature. Other features include an attached hood with adjustable drawstring, front hand-warmer pockets and rib-knit cuffs and waist band to keep out the cold. Heather Gray fiber content is 70% cotton / 30% polyester. Charcoal Heather fiber content is 55% cotton / 45% polyester.